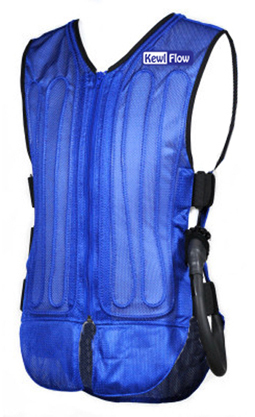 Are you looking for a body cooling vest? This KewlFlow™ Personal Cooling System is a self-contained highly portable cooling system that utilizes a lightweight vest through which ice-chilled water is circulated for efficient cooling. Our Circulatory Cooling ( Active Body Cooling System ) offers a highly effective way to provide convenient and controlled cooling to the body by circulating cool water throughout the vest. Our vest has a clean, discreet appearance with water lines hidden beneath the fabric. Circulates cold water around the body. Keep your cool with water based cooling systems. This KewlFlow™ Personal Cooling System is a self-contained cooling system that utilizes a lightweight vest through which either air or cold water is pumped through the vest to keep you cool and comfortable. Now compare your measurement to the size chart below to determine your size. Small 18" to 20" 30" to 50" 28" to 48"
Medium 20" to 22" 32" to 55" 30" to 52"
Large 22" to 24" 35" to 60" 32" to 57"
Extra-Large 24" to 26" 38" to 66" 34" to 62"
Personal Cooling System is a self-contained highly portable cooling system that utilizes a lightweight vest through which ice-chilled water is circulated for efficient cooling.